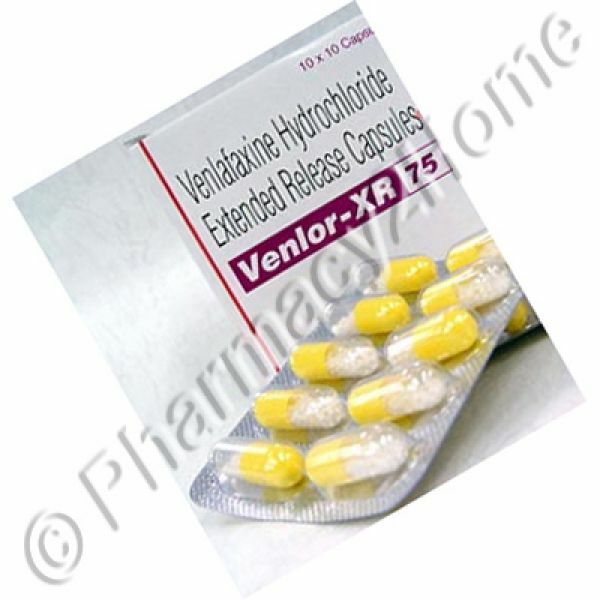 What is Venlor Xr 75 & 150 Mg? Venlor XR is a medicine prescribed to treat various kinds of depressive and anxiety disorders like panic attacks, bipolar depression, suicidal ideations, social anxiety disorder, and sleep disorders. Venlor XR contains Venlafaxine as the active drug. It is an antidepressant belonging to the group of SNRIs (serotonin-norepinephrine reuptake inhibitor). Venlor actively inhibits reuptake of neurotransmitters serotonin and norepinephrine. It is also a weak reuptake inhibitor of dopamine. By this activity it restores the balance of these chemicals that are responsible for mood balance and happiness. Store it in a cool and dry place away from the reach of children. How to take the medication? Take it orally with food preferably at the same time each day. Swallow the tablet whole. 37.5 mg, 75 mg & 150mg - Dosage depends on the condition being treated and requires titration until desired effect is achieved. Consult your doctor for your prescription. Consult your doctor right away. If it is time for your next dose, then skip the missed dose or else take it as soon as you remember. Do not double dose. Inform your doctor of any other medicines that you are taking. Do not consume alcohol when taking this drug. The patient on this medicine should be watched for any suicidal attempts. Use with caution in elderly, very young patients, and pregnant women. When should Venlor Xr (Venlafaxine) not be used? How long should you take Venlor Xr?